A mild formula which calms irritation-prone skin and delivers lasting moisture to sensitive hands. Touch, grab, hold, communicate – our hands do a lot, and they need special care in return, especially if you have sensitive skin. The protective shell of the organic almond enfolds a precious oil-rich kernel. In just the same way Almond Sensitive Skin Hand Cream protects the sensitive skin of your hands. The mild formula, with organic almond oil, reinforces the skin’s own protective function and therefore defends against exposure to the elements. At the same time it delivers lasting moisture, thereby reducing feelings of skin tightness. Fast-absorbing Almond Sensitive Skin Hand Cream calms skin prone to irritation and leaves sensitive hands silky soft. INCI: Water (Aqua), Prunus Amygdalus Dulcis (Sweet Almond) Oil, Alcohol, Behenyl Alcohol, Glycerin, Tapioca Starch, Cetearyl Glucoside, Chondrus Crispus (Carrageenan) Extract, Xanthan Gum, Lactic Acid, Fragrance (Parfum)*. * from natural essential oils. 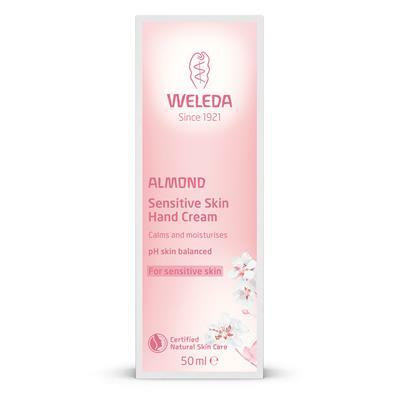 Apply Almond Sensitive Skin Hand Cream on your hands and gently massage in. 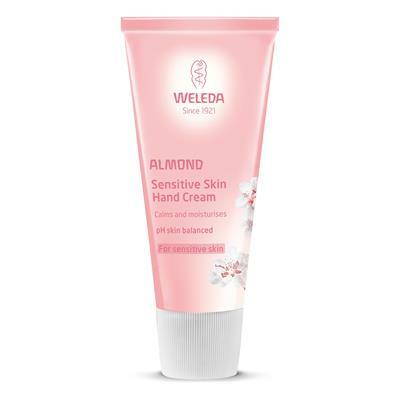 For all-over comfort to your skin, try Weleda Almond Sensitive Skin Body Wash and Almond Sensitive Skin Body Lotion.